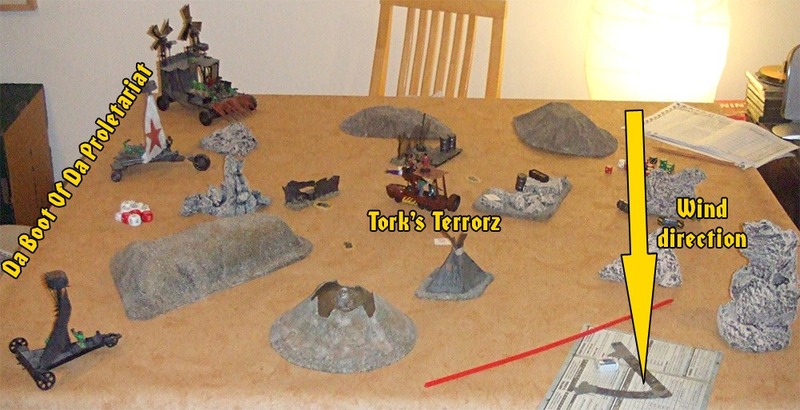 Tork’s Terrorz (200) are finally starting to get some respect in Mektown and are looking to capitalise on the momentum and ensure no Ork spits in their pints any more (or at least while they’re watching). Da Boot of Da Proletariat (152) are just starting out and really need a win. So far their head honcho, Vlad, has mostly been writing speeches and the GRC think it’s high time he started pulling his weight. So, we done custom, I meanz kustomised the speargun, and Larz is packin’ a spiffy new (old) shoota. That oughta impress those stuck-up green gitz in Mektown! But they wasn’t too impressed when Ansvark’s spiffy new (old) choppa ‘sploded in his face last time. Maybe we should be more kunnin’ and pick on someone smaller. They think, I meanz fink, we don’t see them ridin’ dis way, but a Digga can out-sneak a Grot any day. We blendz into da desert betta! With da high windz today we shall utilise our extra speed to swoop in with our cuttas. Ded nippy in this weather! Meanwhile the splattapult onboard da big lugga, as well as small armz fire from same will try to keep dem Diggas distracterised long enuff to cover da cuttas escape. Trust me, ladz, we’ll be fine! Spotting Vlad’s crew closing in Tork’s lads locked and loaded, heading straight for the Big Lugga with malicious intent. Balthazark, the mob’s shaman, grinned widely at the prospect of using the newly upgraded spear gun although his excitement was somewhat stymied by a minor stoppage after the first volley. Peppering the enormous grot vehicle with spears was satisfying but despite penetrating its flimsy armour with ease very little actual damage seemed to occur. 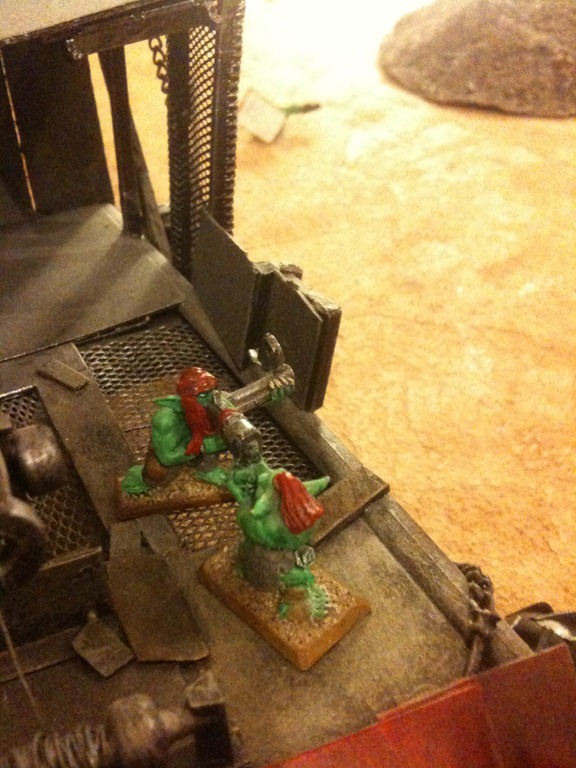 Larz felt it was best to grab some of the scrap and prepare to intercept any Grots feeling particularly possessive. Vlad decided to lead the cutta’s kiting attempt, pushing along the edge of the big dune and towards the filthy lucre. With the wind kicking up to gale proportions it was easy to travel 15”. 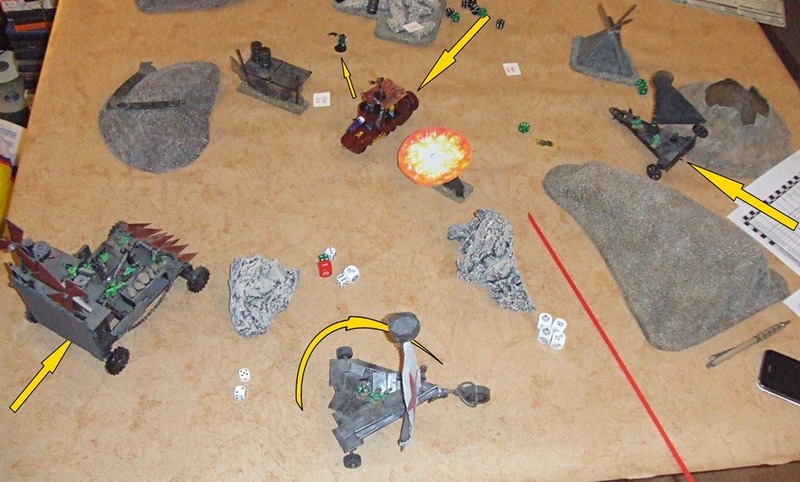 The other cutta was less fortunate, realising that the movement of the Digga trukk blocked the only way in for it. With minced curses the plucky green crew hopped off and lifted the whole vehicle, shuffling it into a 90° turn to starboard. The big lugga, under the command of the banna waver pushed forward towards the Diggas, hoping for a ram and some good use of their new splattapult. 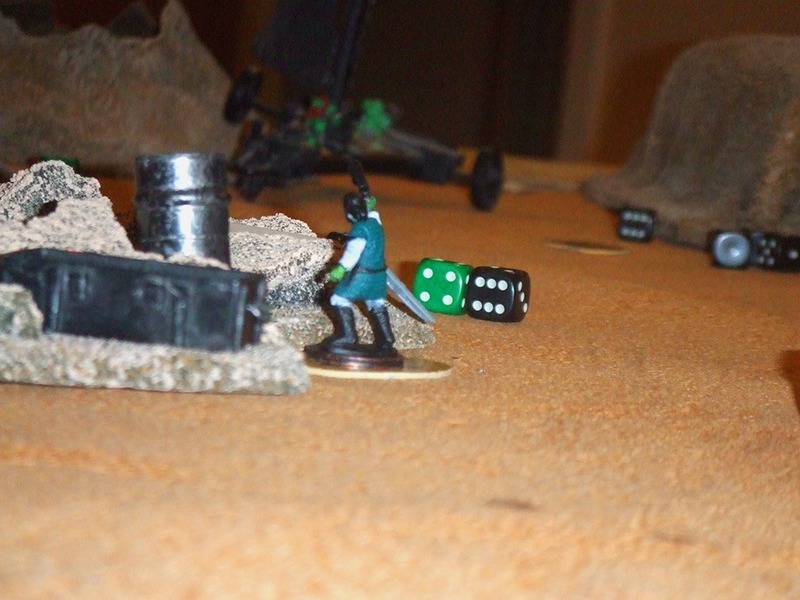 Sluggas, six-shootas, and a single shoota were levelled at the Digga trukk but to no avail. Skee eyed the range and did his best but with a mighty twang he could only watch as the burna load he’d spent so long preparing spattered harmlessly on some barricades, leaving the enemy vehicle unscathed. Wasting no time a neat thrust by Tork put the Digga trukk in the safe zone within which the splattapult could not hit them. Meanwhile Balthazark had cleared the stoppage and rattled off six spears in fewer seconds, exhausting his supply in doing so. 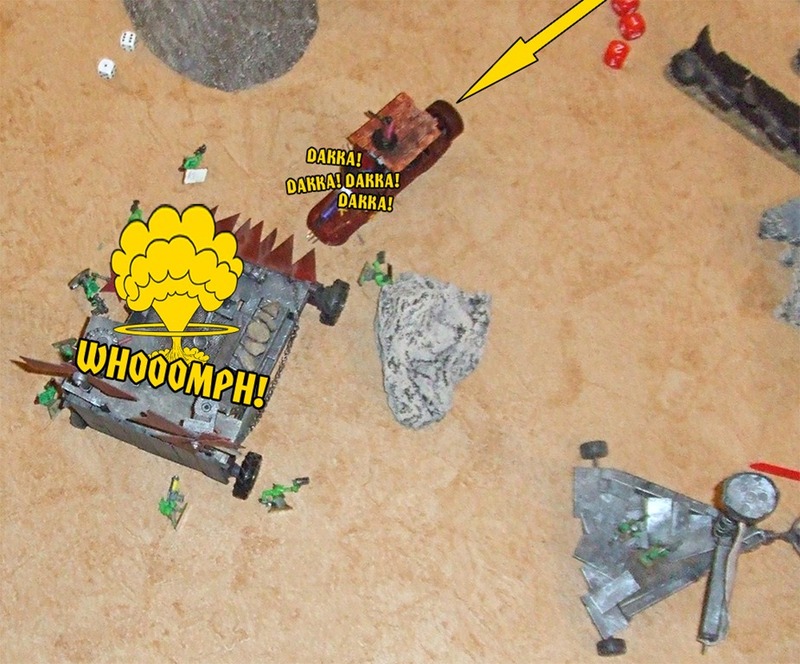 This time the results were much more noticeable though as a direct hit on the cogs powering the huge vehicle were hit, exploding everywhere and throwing green skins in every direction! Larz was not sitting on his hands and letting the rest of the lads have all the fun. Putting down the scrap he was lugging he hefted his new toy at the oncoming cutta. 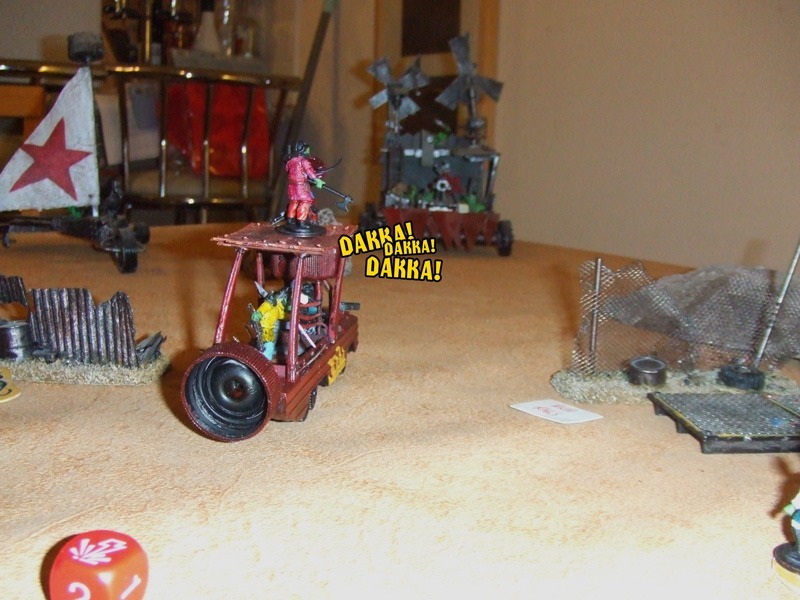 With a mighty “BRAKKA BRAKKA!” he found himself the proud owner of a fully-automatic shotgun, an easy match for any Ork kannon. Firing it felt good, but not for the grots! Vlad watched as the hull and sail of the cutta he was on rapidly became little more than holes connected by fine metal strips. Argh! With two vehicles down and four lads out of action already Vlad couldn’t take the pressure and bottled, despite Flamekebab’s protestations and the GRC’s “Not A Single Step Back!” policy. 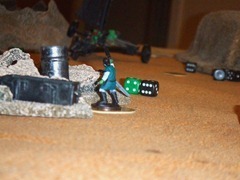 Of the grots taken out of action all made a full recovery, with the exception of Gorba, who Tork captured. The Big Lugga was patched up but became unreliable while the cutta was back up and running with minimal fuss. Due to the big difference in mob ratings every grot levelled up, although Layka gained Impressive Scars and challenged for leadership, feeling Vlad had been given his chance. A fight was held and Vlad cut the upstart down giving him a beating to remember. At least the head honcho got to save some face! Aside from that not a single toof was earned, leaving the mob somewhat downcast. Tork on the other hand was pleased as punch, taking home seven scrap counters. When combined with all the other income earned by the mob the lads rolled into Mektown with more teef than a shiver of squigsharks (Skippy actually hit the maximum bracket for income, earning over 50 teef before expenses!). Result: Victory to Tork’s Terrorz. This entry was posted on Monday, September 19th, 2011 at 02:18	and is filed under Battle Reports. You can follow any responses to this entry through the RSS 2.0 feed. You can leave a response, or trackback from your own site.